I had been looking at Peak 1,340ft for a few years now, a lowly summit with almost 700ft of prominence and the highest point in the hills east of Fremont between Interstate 680, Niles Canyon and the SF Bay. Located completely within private ranchlands, I thought I might be able to find a way up the steep north side from Niles Canyon Road. Poison oak would likely be a concern along that route and it didn't appeal to me strongly enough to give it a try. While perusing online info one morning, I noticed that David Sanger, a prolific Bay Area climber, had posted a short TR on peakbagger.com. He mentioned coming from the east off Morrison Canyon Rd, utilizing the new Vargas Plateau Regional Park to start, followed by some cross-country (trespassing) to the summit. This seemed a much easier route with two hitches. For one, half of the two mile route still goes through private property, not as remotely as the route up from Niles Canyon. Secondly, the park is not yet open to the public though scheduled to open sometime in Spring. Hopefully, they wouldn't be putting the finishing touches on it when I visited. I found the staging area/TH easily enough, parking just off the road near the park entrance on Morrison Canyon Rd. The "trails" are old ranch roads, recently mowed to clear a path for hikers and equestrians. 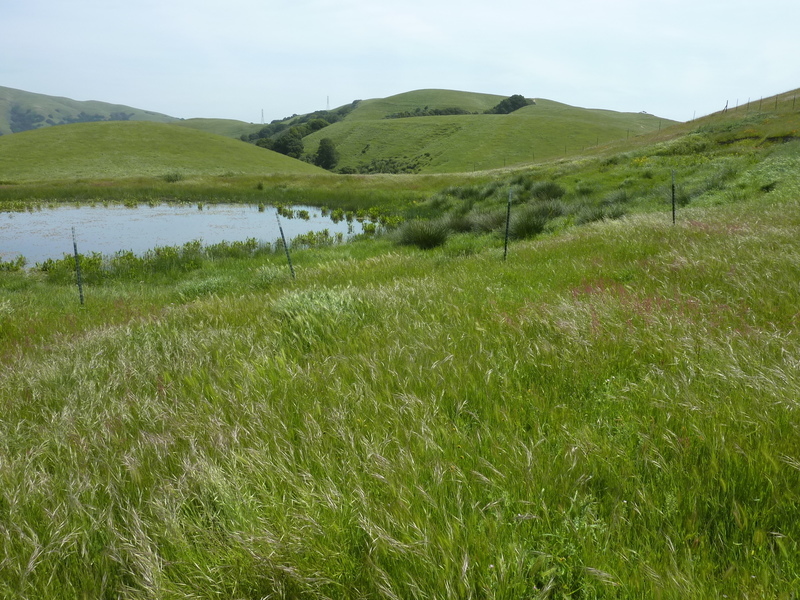 This year's rains have been spread out over the whole winter/spring season, allowing the grass to grow quite tall and stay green through the end of April. There are cows grazing in the park and adjacent ranch lands, but not enough of them to put much of a dent in the lush grasses. For much of the hike along the trails there are nice views of the East Bay and the communities that line its shores, though today there was much haze and high clouds due to an incoming storm system. I followed the trails through several gates, eventually reaching the park boundary near a pond with Peak 1,340ft visible to the east in the background. Bright orange poppies and other colorful flowers can be found in abundance on some slopes. It would have been possible to follow ranch roads nearly to the summit, but this would have entailed going by a number of ranch buildings and leaving myself more exposed to discovery. Instead, I followed a cross-country route to the north, kept from view to the south by an intervening low ridgeline. My path took me along the north edge of the ranch property I was hiking through with a fine view of Niles Canyon on the north side. In following along some cow trails, I happened upon a free-ranging horse, alone in the shade of some oaks. It let me pass within about 10ft without seeming upset in the least by my presence. Similarly, I passed by a handful of cattle a few minutes later who kept a watchful eye on me but did not otherwise see reason to move off. I found the summit of Peak 1,340ft a sea of tall grass up to my waist. Once the grass browns and the seeds mature, it would make for an awful sock and boot smothering thistle and burr-fest, but for now it was an easy stroll. The broad, rounded nature of the summit does not make for particularly good views, especially with today's haze. Sunol Peak can be seen to the north across Niles Canyon and Mission Peak well to the south. I returned via much the same route to the park, strolling to the top of a spur trail to something signed as View Point. As one of the higher points inside the park it has perhaps the best views overlooking the East Bay. As I was strolling south off this point I suddenly noticed a tractor stopped at one of the gates below. Its driver was unlocking the gate to get the tractor through. I stopped and lay down in the grass to avoid detection, watching carefully as the tractor moved through the gate, the driver re-locked it and the tractor continued on. It moved exceedingly slow along the trail, mowing the path wider as it went along at almost a crawl. I had to lie there for perhaps 15min before it was out of view, following the same route I had used earlier and had intended to use for my return. Instead, I decided to head cross-country to the south along the eastern edge of the fenced boundary, moving to the private property and back as needed to avoid being seen. For all I know the driver may not have cared that I was out there hiking, but it seemed better to avoid a confrontation lest things turn out poorly (for me). Eventually reaching Morrison Canyon Rd, I hopped the fence along the road and was soon back to the car, the whole outing taking less than two hours. I look forward to your posts as part of my daily routine. Your stories and pictures take me away from "my cube". Vargas Plateau opening this week - Thursday. It will take all the fun out of it but it will be legal. Of course only the first half will be legal.